The upcoming IPO of Ujjivan Financial Services has received unanimously positive recommendations from analysts at brokerage houses and research agencies. The IPO, which opens today, has been priced in the range of INR207 – 210 per share. The microfinance lender will not get any funds through the IPO, but the public offer will be helpful in bringing down foreign shareholding. This is a crucial regulatory requirement for the company which received RBI’s in-principle approval to set up a small finance bank (SFB) last year. As of now, 77.1% equity of Ujjivan is with foreign shareholders but this figure is scheduled to come down to 44% after the IPO. Read Also: Ujjivan IPO review: Is it better than Equitas? Analysts at Prabhudas Lilladher have recommended investors to SUBSCRIBE to the upcoming IPO. “At upper band of INR210 UFSL will trade at 1.6x based on post‐issue book value of INR130 which we believe is fairly priced. We recommend investors to subscribe to the issue,” said the company’s research note. Similarly, Choice Broking finds the issue attractive when compared to valuations of its listed peers. “Going forward, we believe that its strong geographical presence, management capability, availability of low cost of funds and increased opportunity as a SFB will help the firm to increase business. At higher price band of Rs210, UFSL’s stock is available at P/BV(x) of 2.8 of its 9MFY16 BVPS (post issue), which is available at 32% discount to its peers such as Equitas Holding, SKS Micro finance etc. Thus, we assign ‘Subscribe’ rating to this issue,” said the Mumbai-based brokerage house. 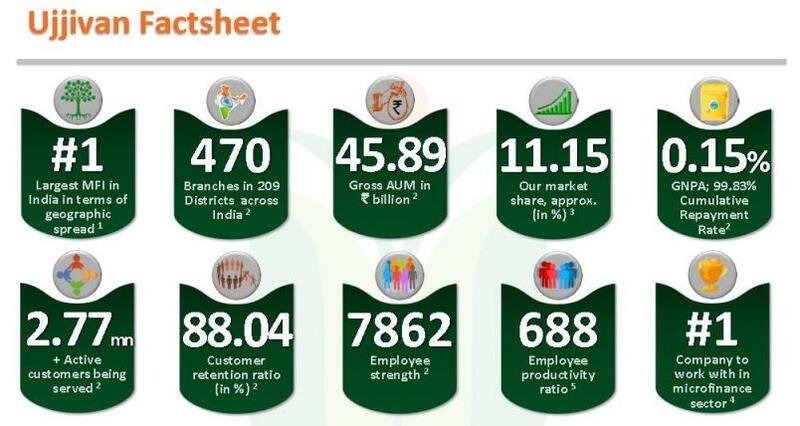 “With a successful track-record attributed by higher customer retention rates, customer led branch expansion, enhanced employee productivity; strong individual loan trajectory, lower credit costs and improved operational efficiencies reinforce our belief in the earnings traction going forward. We, therefore, advise to SUBSCRIBE for the said IPO both for listing gains and to reap long term benefits,” said KRChoksey in its IPO note. “For a well established player like Ujjivan, valuations at 1.6x post money book are reasonable, especially considering the fact that it can deliver strong growth and RoAs in excess of 2% even after conversion to a small bank,” said Antique Stock Broking which has put a Subscribe rating on the IPO. These positive recommendations on the IPO are in line with Ujjivan’s strong business fundamentals and attractive valuations compared to competition that we have highlighted in our review of the IPO. As a result, Ujjivan is commanding strong premium in the IPO grey market. Grey market premium on the IPO is around INR45 – 50 per share indicating positive listing.